Background and aim: Psychopathology often recurs in the same families over the course of multiple generations. Only a clear understanding of the processes underlying the transmission of psychopathology will help the formulation of effective prevention and intervention programs for families at increased risk for psychopathology. 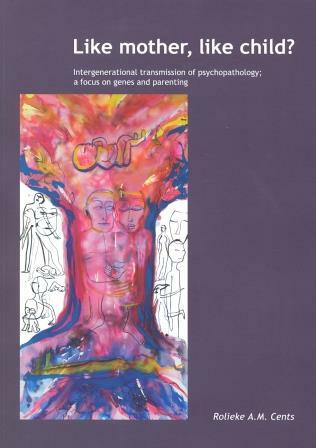 The main aim of this thesis was to enhance current insight into the intergenerational transmission of psychopathology. We focused on assessing the nature of associations between grandparental, parental and child psychopathology. Also, we focused on the complex roles of genes and parenting behaviors in the transmission of psychopathology. Methods: All studies included in this thesis were embedded in the Generation R Study, a prospective population-based cohort study from fetal life onwards in the city of Rotterdam, the Netherlands. Information on characteristics of children and their families were mainly derived from parental postal questionnaires and from observational measures obtained at the research center. Results: Children are at increased risk for psychopathology in the presence of a history of grandparental psychopathology or divorce, independent of parental psychopathology. Also, we found that maternal depressive symptoms follow four distinct, but rather stable, trajectory groups during pregnancy and the first three years after childbirth. Children of mothers assigned to the higher trajectory groups are at increased risk for psychopathology. Furthermore, it was shown that genetic variants may act to exert their influences on child behavior as early as fetal life. Moreover, genetic variants involved in child behavior may also be involved in maternal parenting behavior. Last, we identified a novel polymorphism for early spoken language. Conclusions: The findings of this thesis underscore the complexity of the processes underlying the intergenerational transmission of psychopathology. Researchers and clinicians should adopt a family wide perspective when assessing the risk of psychopathology in children. Also, insights from genetic and environmental research should be combined. Sponsor The work presented in this thesis was supported by grants from the Sophia Foundation for Scientific Research (SSWO; grant 547, 2008) and the Netherlands Organization for Scientific Research (NWO) (VIDI 017.106.370). Financial support for the publication of this thesis was provided by the ‘Department of Child and Adolescent Psychiatry/Psychology’, the ‘Generation R Study’, the ‘Erasmus Medical Center’, ‘SBOH’ employer of GP trainees, ‘Chipsoft’, and ‘Cents Assurantiën’ insurances and financial advice. Note The Generation R Study is conducted by the Erasmus Medical Center in close collaboration with the Erasmus University Rotterdam, School of Law and Faculty of Social Sciences, the Municipal Health Service Rotterdam area, Rotterdam, the Rotterdam Homecare Foundation, Rotterdam, and the Stichting Trombosedienst & Artsenlaboratorium Rijnmond (STAR), Rotterdam. We gratefully acknowledge the contribution of general practitioners, hospitals, midwives and pharmacies in Rotterdam. The first phase of the Generation R Study is made possible by financial support from: Erasmus Medical Center, Rotterdam, Erasmus University Rotterdam and the Netherlands Organization for Health Research and Development (ZonMw) (grant no.10.000.1003).